KOCHVILLE — A U.S. Paralympian had special words for the young athletes at the National Junior Disability Championships at Saginaw Valley State University. Ogbe, a Nigerian native, told his own story of growing up in a country where running water and electricity were luxuries at the opening ceremonies of the championships. As a three-year-old, Ogbe contracted Polio, which left his left leg partially paralyzed. Ogbe found success in field events such as the shot put, discus and javelin. That opened a window for him to come to Louisville to attend Bellarmine University on a partial scholarship. The championships are a time to pull each other up and compete, but he emphasized the importance of education. In February, Ogbe competed in the World Championships and was a teammate of Caro’s Scot Severn. The U.S. team chose Ogbe to carry the flag in the Parade of Athletes, which Ogbe described as a higher honor than winning gold or silver. “I pray one day you are all Paralympians,” Ogbe told the young athletes. 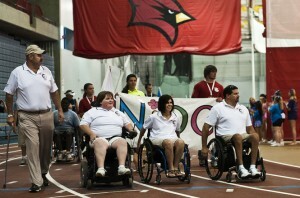 Severn was one of three Michigan Paralympians to lead the Parade of Athletes Sunday in SVSU’s Ryder Center. The yearly championships consist of track and field, archery, swimming, powerlifting and table tennis. More than 200 athletes from across the nation will compete throughout the week. Jeff Coupie, director of Michigan Sports Unlimited, said it is an honor to hold the National Junior Disability Championships in the region.